In this tutorial I will be showing you how to work with textures to create unique effects in Photoshop. 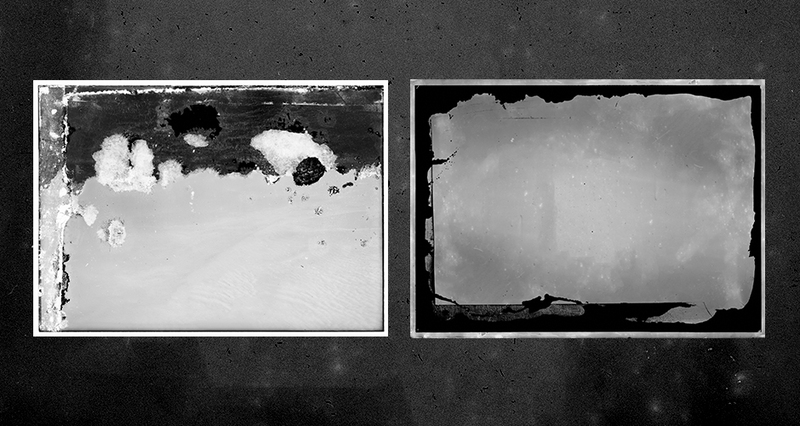 We will be using a handful of awesome glass plate negative textures courtesy of Blue Line Design from the all new Totally Extensive Textures and Patterns Bundle in combination with a free landscape photo to create a very nice treatment. 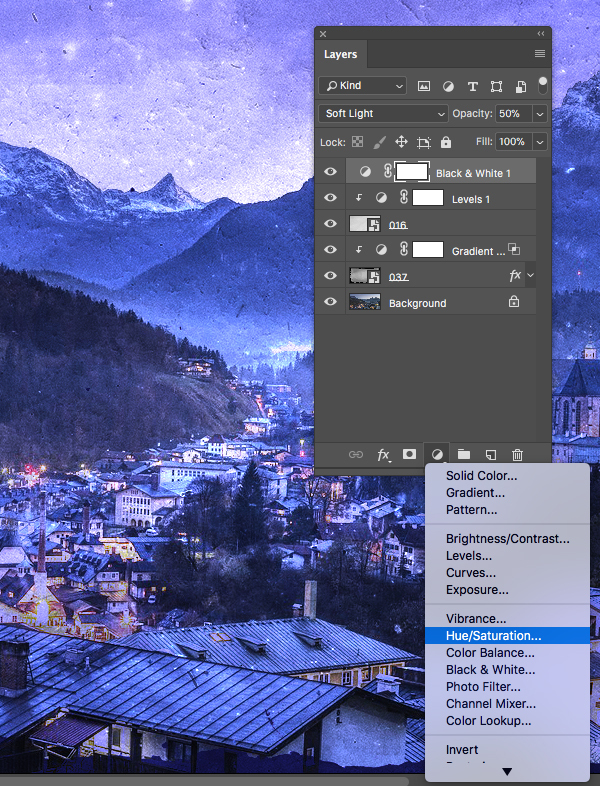 The techniques covered here can be applied to just about any type of image and will help bring your creative projects to life! 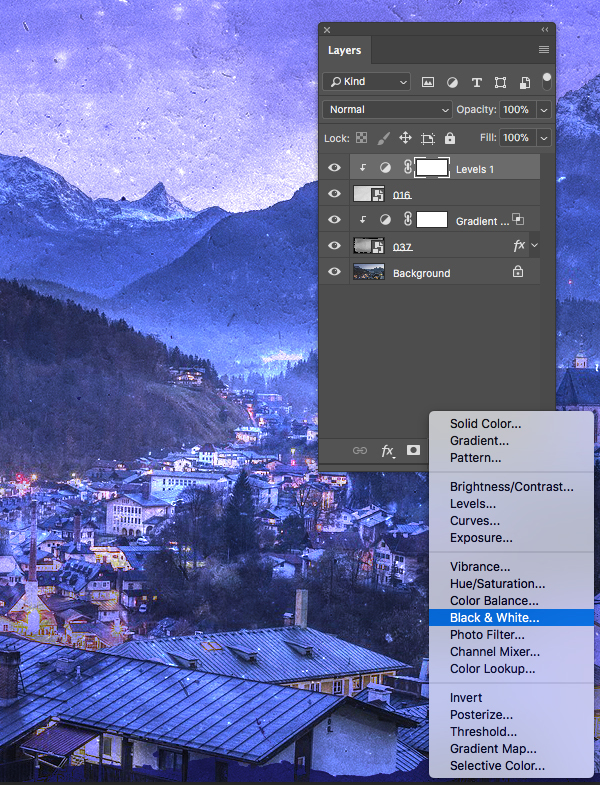 If you are ready to start learning how to use textures like a pro then start up Photoshop and let’s get started! This freebie pack is just a taste of what you can expect to find in the The Totally Extensive Textures and Patterns Bundle for just $29 (that’s 99% off). This collection is the absolute best way to get your creative juices flowing on your next project. Let’s start by opening our free stock photo here which is a very nice free image you can download from Pixabay.com. 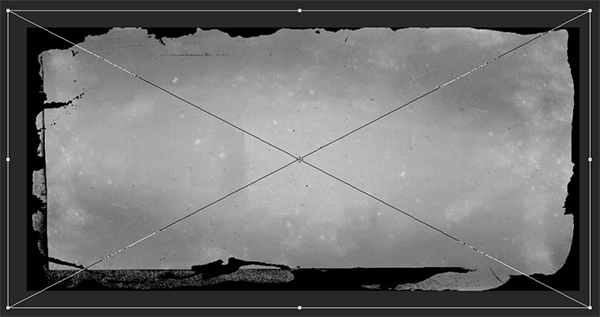 Next, navigate to the freebies folder and find the first glass plate negatives image – ‘037.jpg’ from Blue Line Design. 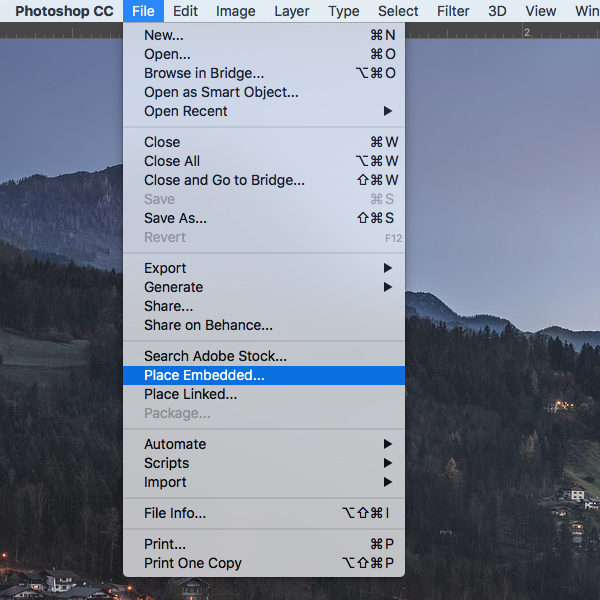 Once you have the file choose ‘Place’ to bring it into Photoshop as a Smart Object. 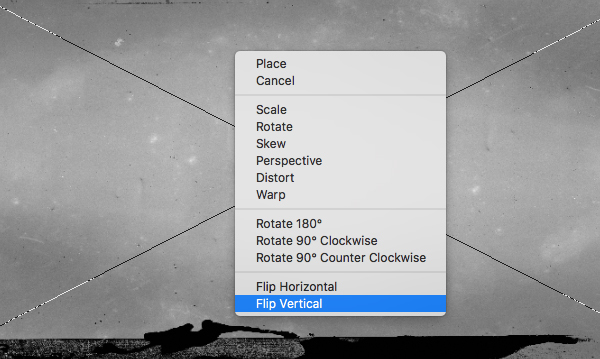 Once the file is imported you should have a bounding box around the image allowing you to transform it. 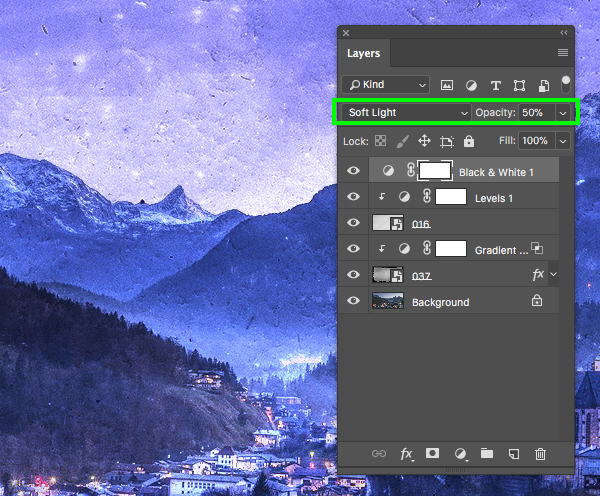 Now that we have our texture placed, let’s begin to experiment with some of the Blending Modes. 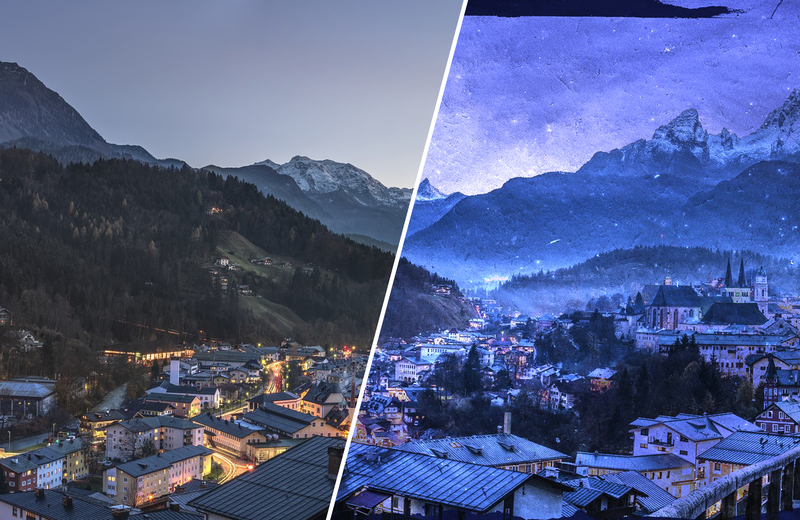 For this particular image, I have chosen ‘Darken’ for the Blend Mode which created a nice effect, but experiment with a few more of these to see what kinds of interesting results it may produce! For the fill color let’s enter the hex value ‘#0B0FAC’ and then press ‘OK’ twice to apply the changes and close out of both dialog boxes. 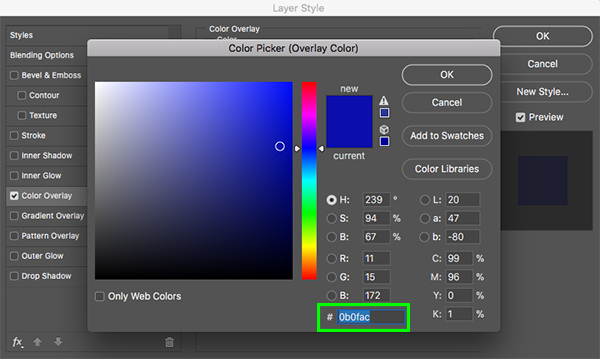 Next, select the ‘037’ Smart Object layer and then hold the Alt/Option key and click on the Adjustment Layer icon found at the bottom of the Layers Palette. 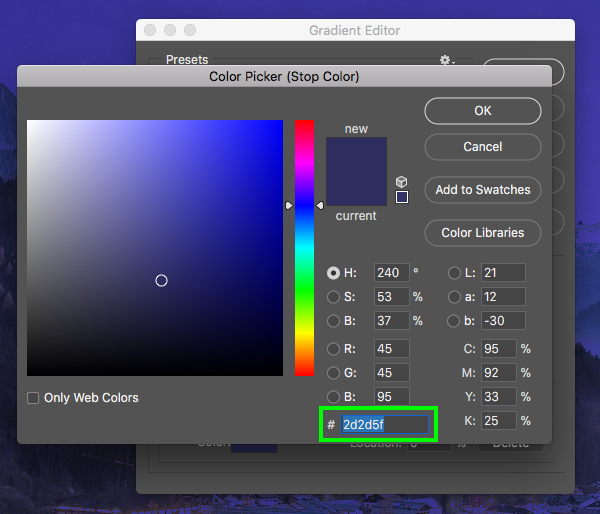 From the menu that appears, select ‘Gradient Map’. 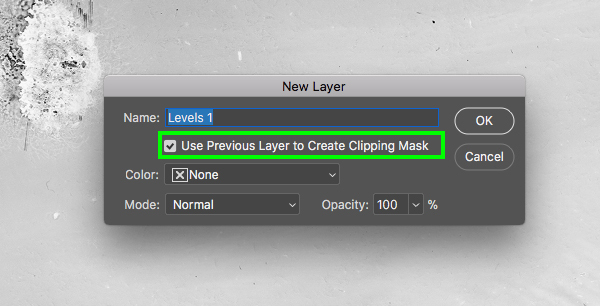 You will now be prompted with a dialog box where you’ll want to check off the option that says ‘Use Previous Layer to Create Clipping Mask’ and then click ‘OK’ to proceed. 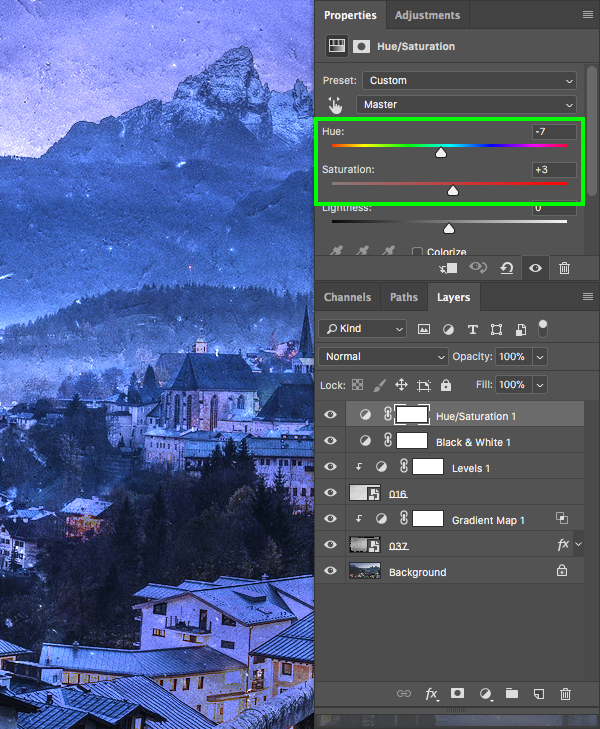 This will ensure that our Adjustment Layer has a Clipping Mask applied to it so it will only affect the layer that it’s attached to. 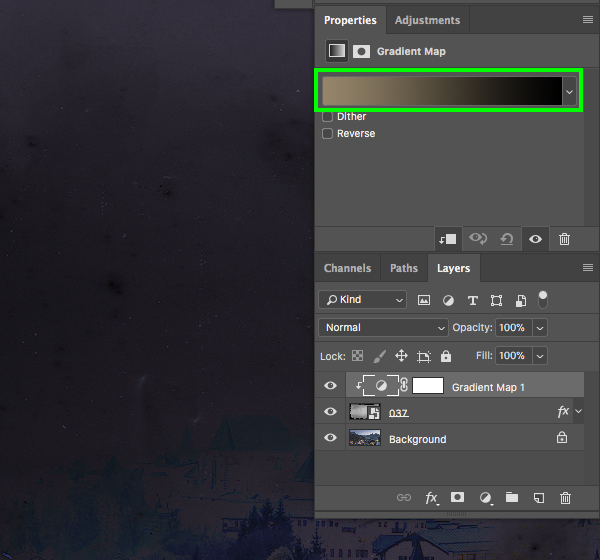 After applying the Adjustment Layer you will see in the ‘Properties’ panel that there is a color strip containing a gradient. Let’s click on this and in the next step we will modify the colors. 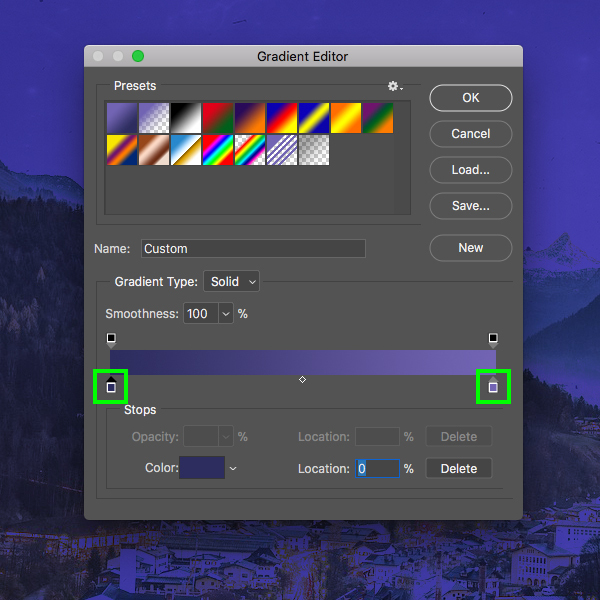 You should now have the Gradient Editor up on your screen and here you will see the gradient in the bottom of the dialog box. You should have one color on the left and one on the right. You will also notice that each color has a small box below, and one above. 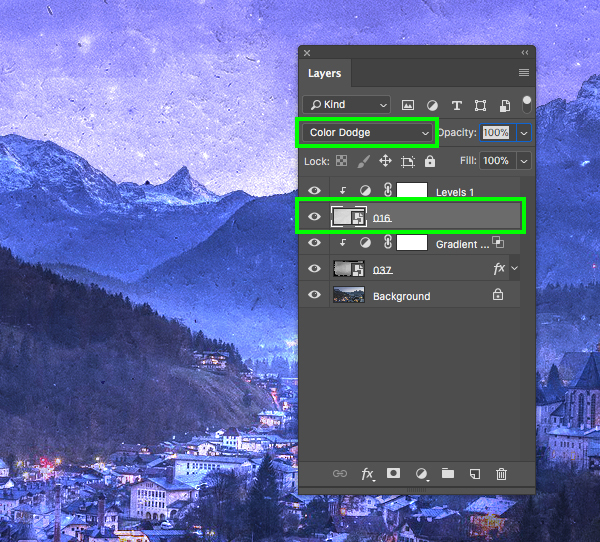 The top square icons above each of the colors represents the opacity, but for now we are only concerned with the bottom boxes which control the fill color. 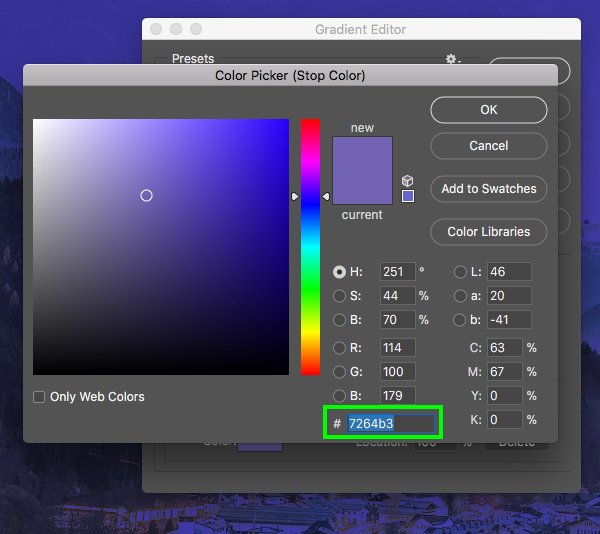 Let’s click on the first color on the lower left of the gradient editor. 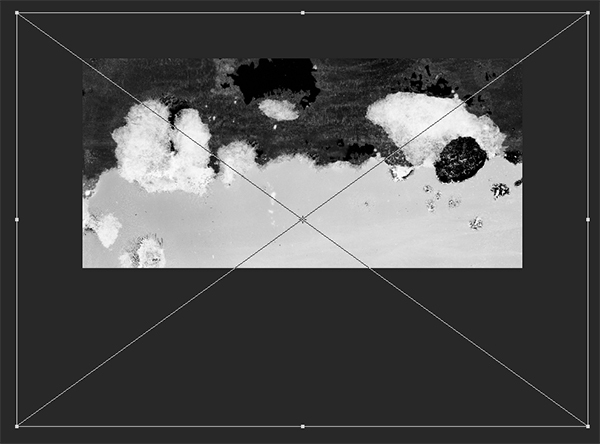 We can now close out of the editor and from here just reduce the opacity to ‘80%’ to lessen the effect a bit. Let’s go back to the File menu and choose ‘Place Embedded…’ once again. 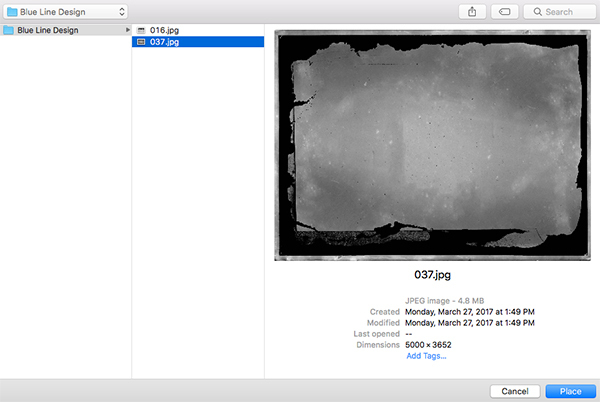 This time, navigate to the ‘016.jpg’ file in the freebies folder for this tutorial and choose ‘Place’ from the bottom right hand corner. 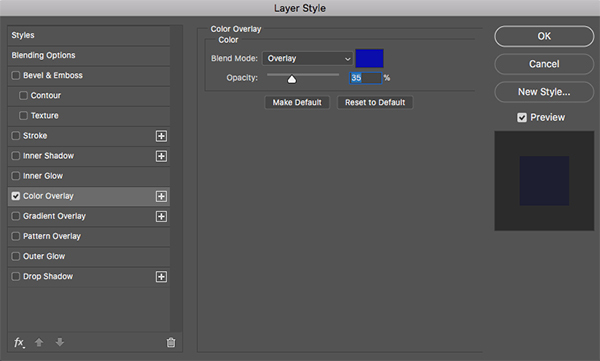 After scaling and placing the text, make sure the ‘016’ Smart Object layer is highlighted. 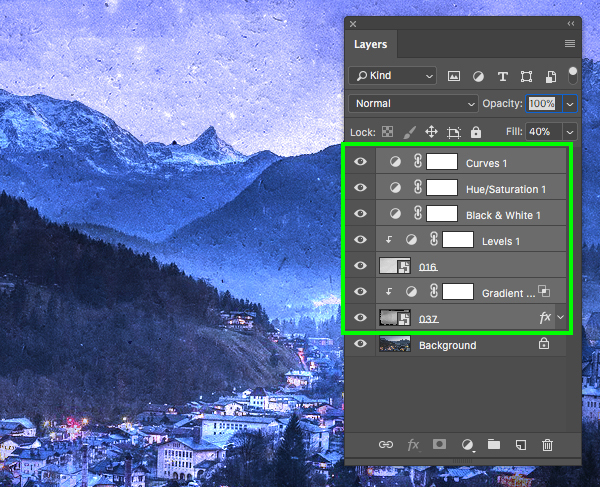 From here, hold the Alt/Option key and click the Adjustment Layer icon at the bottom of the Layers Palette before choosing ‘Levels…’ from the list. 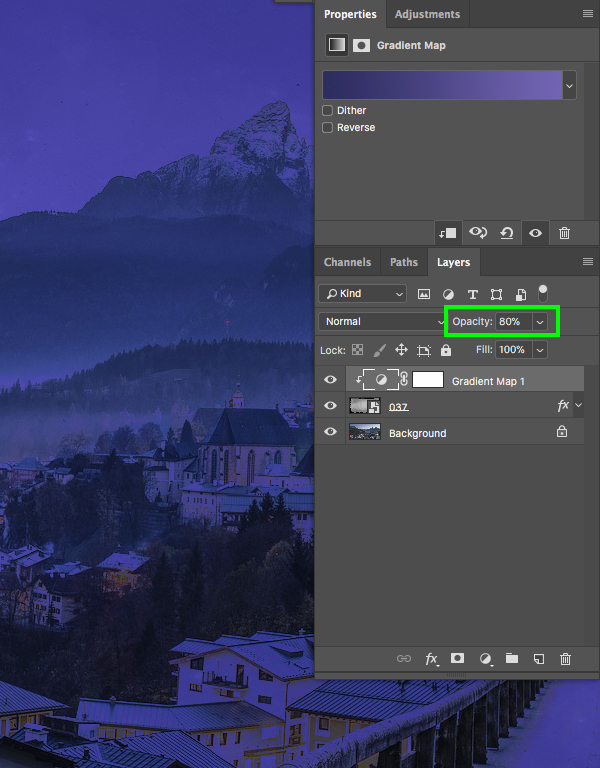 On the next screen, check off the ‘Use Previous Layer to Create Clipping Mask’ option and then press ‘Return’ or click ‘OK’ to proceed. 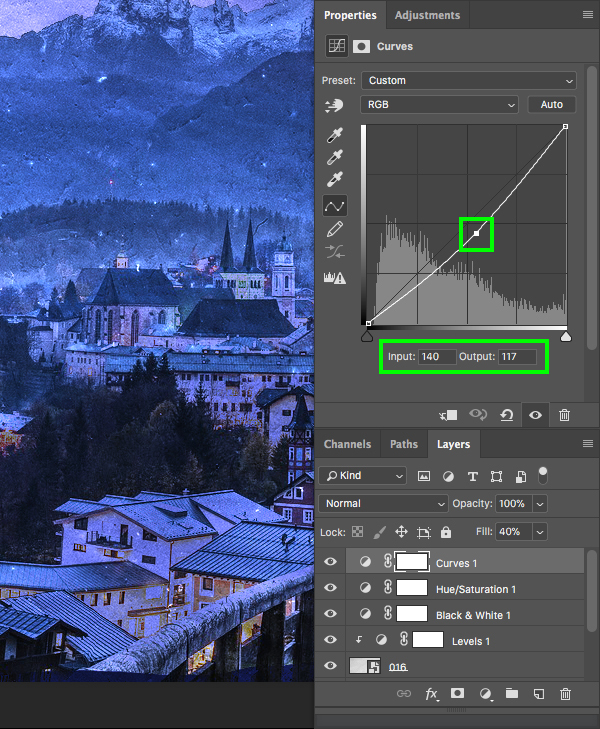 Just like earlier, this will ensure that our Adjustment Layer has a Clipping Mask applied to it. 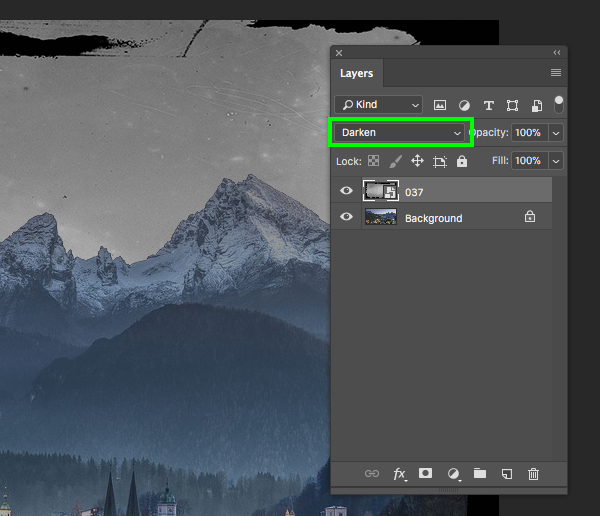 Select the Smart Object texture layer and this time let’s change the Blend Mode of the layer to ‘Color Dodge’ which will make the lightest parts of the texture layer stand out. 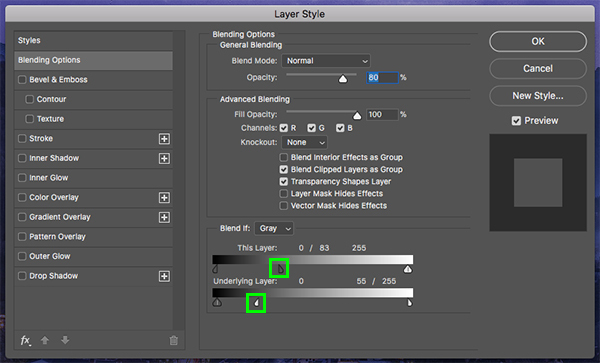 Make sure your very top layer is selected, which should be the Levels Adjustment layer. 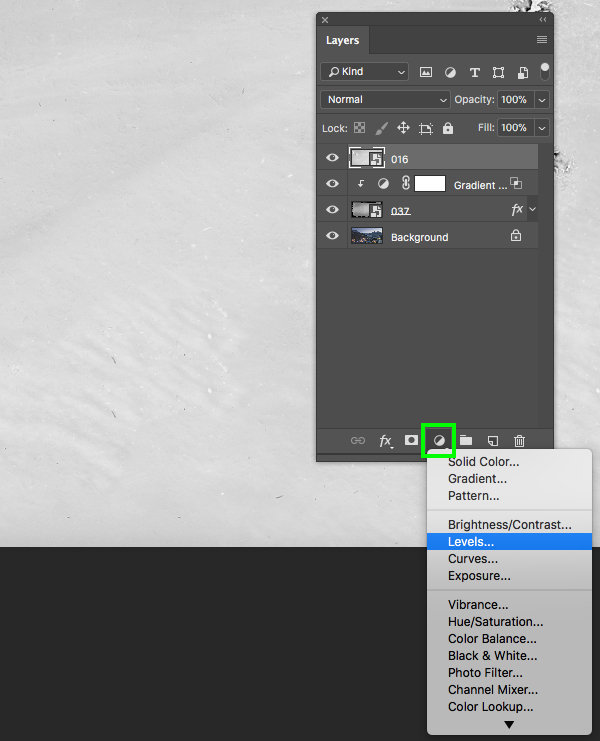 From here, click on the Adjustment Layer icon and choose ‘Black & White…’ from the list. 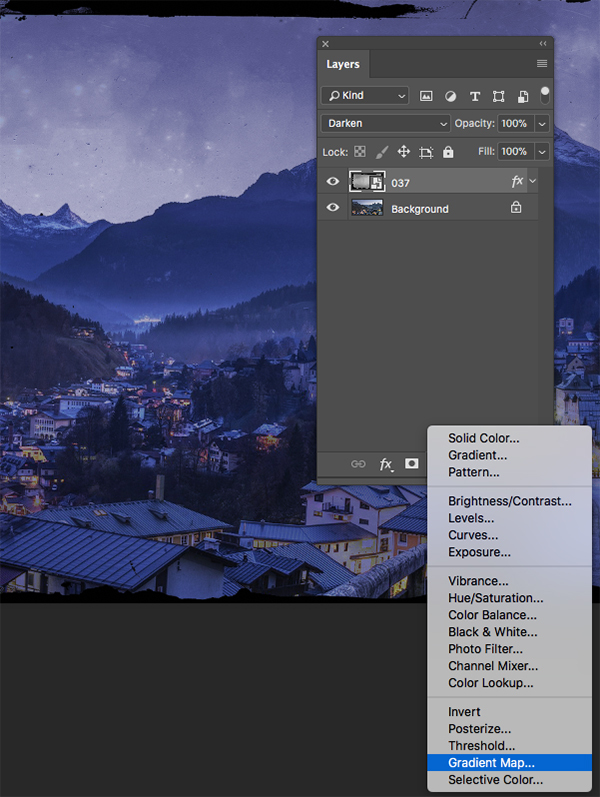 With your previously created ‘Black & White’ Adjustment Layer selected, go back to the Adjustment Layer icon at the bottom of the Layers Palette and this time choose ‘Hue/Saturation…’ from the menu. 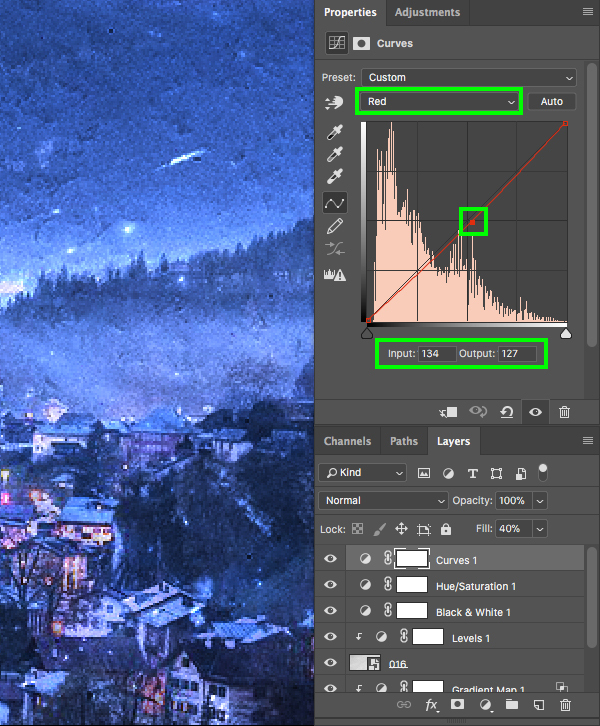 For the properties here let’s move the ‘Hue’ slider to a value of ‘-7’ and the ‘Saturation’ slider to ‘+3’ to give it a bit of a subtle boost. 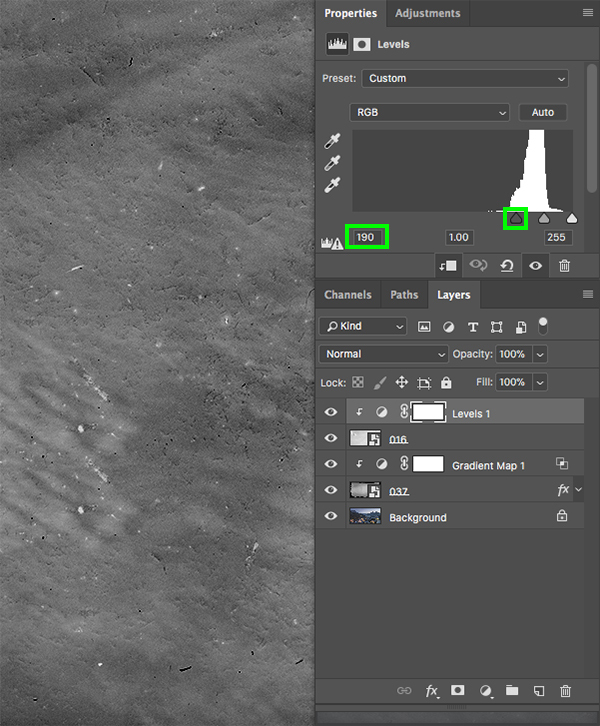 Now that we have applied some global adjustments let’s select the very top layer in the palette, hold the Shift key, and click on the ‘037’ Smart Object layer so all of your layers except for the original image are highlighted simultaneously. 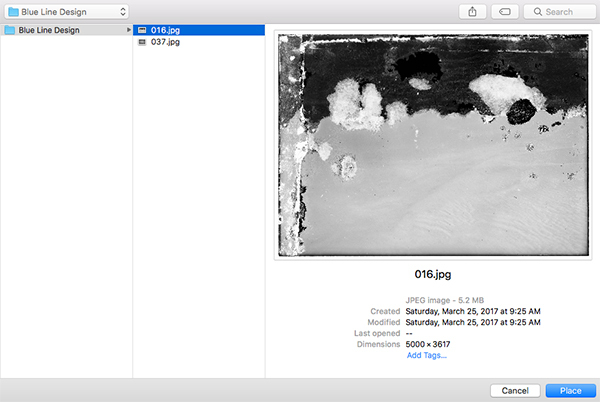 From here, press Command/Ctrl+G to place the layers into a folder and double click the ‘Group 1’ text to rename the folder ‘TEXTURE EFFECTS’. Now we can see the before and after simply by turning the visibility of this folder on and off. 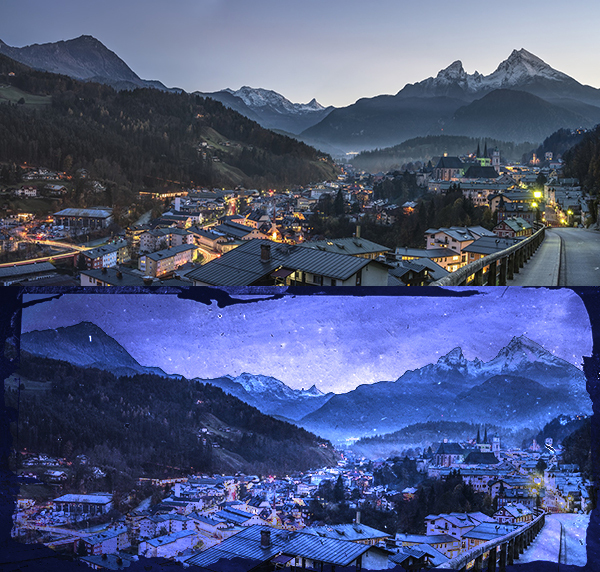 We have now finished our photo treatment using several high quality textures in Photoshop! To achieve this look we used just a few textures from The Totally Extensive Textures and Patterns Bundle. This all new texture and pattern bundle is based entirely on the feedback from the Design Cuts community! Get your creative juices flowing with this amazingly varied and versatile collection for an unbeatable 99% discount! The textures we’ve used in this tutorial are from the The Totally Extensive Textures and Patterns Bundle which featured a wide range of textures including paper/card, abstract, ink, glitch, chalkboard, wood, nature, marble, Art Deco, grungy, futuristic and more! Follow this with a range of gorgeous patterns including ink, colour crush, simple lines, geometric, hand-drawn, craft surfaces and more. Love this tutorial, but unfortunately I missed the bundle! I tried to find the seller and the Glass Plate Negatives bundle in the marketplace, but I couldn’t locate them. Is this item available to purchase individually? 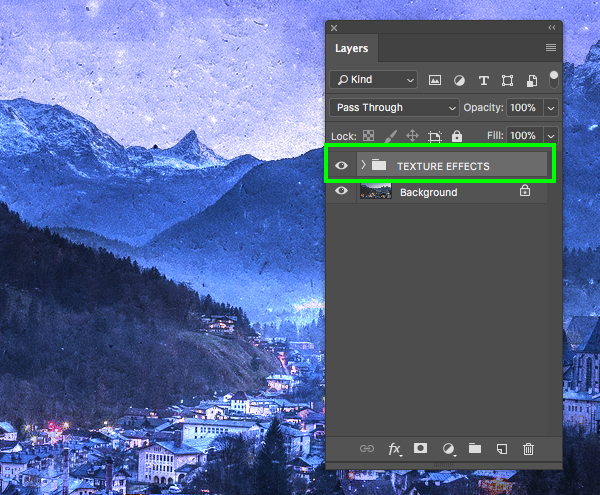 We’re so glad that you love this tutorial and hope that you really enjoyed working with your new textures! Oh no we are really sorry to hear that you missed our Totally Extensive Textures and Patterns Bundle Krystal. Unfortunately we do not currently have this pack in our Marketplace but as the majority of the most popular items in our Bundles are released in our Marketplace after they have expired, you should still have the chance to pick this one up. Me encantan vuestros tutoriales porque siempre aprendo mucho con ellos. Lo malo es que, si no sabes inglés, cuesta mucho seguir los videos, porque los subtítulos en español son muy malos y hay cosas que no se entienden. Thank you so much for your comment and we are so sorry to hear that the translated subtitles on our videos are not always very clear for you to be able to follow along. We really appreciate you bringing this to our attention- we will definitely take your feedback on board and please do pop us over an email if you would like any help with the translations of our videos and we can certainly help! Yay we’re so glad that you found this so useful!